Sierra Point is a viewpoint on the eastern end of Yosemite Valley from which you can see four waterfalls: Yosemite Falls, Illilouette Falls, Vernal Falls, and Nevada Falls. 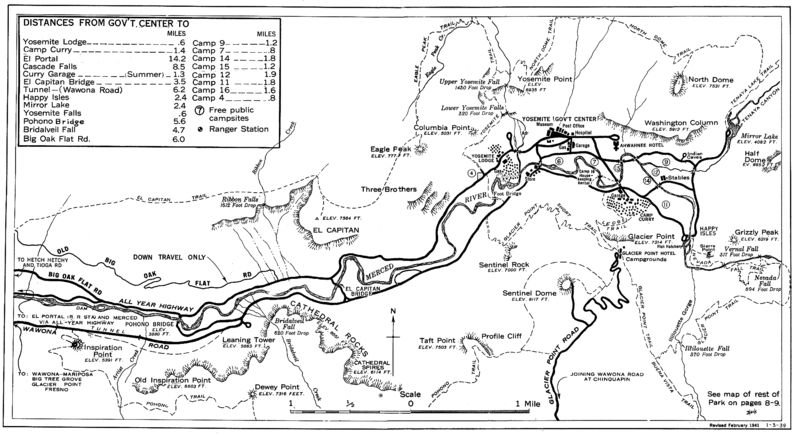 This old map shows a trail to Sierra Point from Happy Isles (look between Happy Isles and Grizzly Peak). However, this trail was closed back in the 1970s due to rock slides. It is still possible to hike to Sierra Point but it is not a nice and easy trail like the others you’ll find out of Yosemite Valley. I personally found the route pretty straightforward and easy using detailed instructions and GPS waypoints given to me by a friend (and readily available via some googling), but I hate to gauge difficulty since it is so subjective. People inexperienced with off-trail travel (especially on steep terrain) and routefinding might find this to be very difficult. So the typical caveat applies: Only you know your skills, comfort level, and abilities so it is up to you to make the call when out there. Sierra Point juts out about half way up the wall between Grizzly Peak and the John Muir trail. The point is visible from parts of the JMT but very few people know to look for it. I felt like I was a super secret spy as I stepped off the main trail and picked my way through the pile of talus. Before long we found the old trail and as we climbed we heard the voices of the hikers on the nearby JMT, a mere few hundred feet away as the crow flies. The old trail still exists, and although it is overgrown and taken out by rockslide in a couple of places it is pretty easy to follow. The hardest part is actually finding the old trail. From the ‘Rock Slides’ sign about 500 feet from the Happy Isles Bridge, climb through the talus for about 200 feet. The terrain kind of naturally popped me out where the old trail is evident, but I wasn’t 100% convinced until I saw some constructed steps jutting through the fallen leaves of the forest floor. The trail climbs steeply. There are a couple of places where it seems to fade away or requires scrambling up a short stretch of rock, but it was always easy to find the way. I recorded the track below on the hike – unfortunately it is not entirely accurate due to the bouncing around of the GPS signal when so close to the granite walls of Yosemite Valley. About .7 miles and 1000 feet up, the trail rounds a bend a pops out on a pile of granite jutting out from the side of the cliff. Get a map and details of this hike here. The view from Sierra Point is worth the effort! There is nothing like seeing the classic Yosemite sights from a different angle. From here you look down on Vernal and Nevada Falls, Illilouette across the way, and Yosemite Falls across the Valley. Best of all, we had it to ourselves. Although the voices of the hikers below carried up to us, we sat there by ourselves for a while, thoroughly enjoying the feeling that Yosemite was all ours. Sweet eh? I hung out up there for a few hours painting and photographing and lunching and we only had one small group of three ranger’s older kids swing through for lunch. Super secret and so many waterfall views from one spot! Can’t wait to hear more on this theme. If you look to the right on your way up the old trail can be seen coming up from the river, never went down that way and have always wondered where it comes from? I have done this hike many times and have only seen other hikers twice…..
Great hike! I love finding and hiking old trails. I’ve done it a bit in the Trinity Alps and in other ranges in far northern California. Your photos are stunning! What a great hike. I was at this spot in 1975 with my father and recently returned with my son. It is the best vantage point in Yosemite. I love the solitude among the masses! I heard about this hike from a friend, then found this description about how to find it. This is such a find, thanks. The whole family (age 11 through 53) made the hike and had a great time. I would only add 2 comments to the description on finding the trailhead, as that was the toughest part. 1. “Rock Pile” sign, not “Rock Slides” (might have changed). No big deal, but just so not in doubt. 2. If you are standing at the sign, looking up perpendicular to the J.M. Trail, the old trail starts at the top of boulders, looking about the 11 o’clock position. We started at 1 or 1:30 direction, found a weak trail, but was too steep. Eventually found correct trail, and we were off & hiking! Awesome, thanks for the additional info! I don’t remember it being too far until the point where we saw some old steps that were clearly trail. I don’t recall cable or posts either – maybe something that got knocked loose in a rock slide? I hiked this trail a few times 40 years ago with a couple of friends. It is one of the magnificent views in the valley.